Jesus made disciples, by calling on people to follow him. By proclaiming the good news of the Kingdom of God. He taught of Love for God, and Love for our neighbors, he fed the hungry, healed the sick, physically, and spiritually. Most of all, he lived a sinless, service focused life. He sought out the poor, the hungry, the lost, and he Loved them. Through this Love, he Glorified the Father in all things. The Coalition to Save Lives has been established solely to support this Save a Life Tour. The Save a Life Tour, begun by Romans Road Ministries, and Positively Uplifting Music Productions in 2015 is more than a free concert. 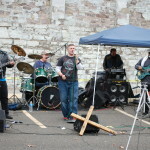 Many talented musicians and performers joined together in 2015 in six cities throughout the Philadelphia/New York Area, and did in fact provide amazing free concerts to inner-city depressed areas. But in addition to the music, in each location we proclaimed the Word of God, sharing the Gospel with those who would hear. 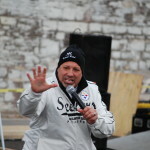 Speakers like Randy DonGiovanni, Rick Cartegena, and Joe Wardle from Rock Ministries Philadelphia shared testimonies, and the Good News of the Kingdom of God. At each tour stop we also provided food and drinks free to all who attended, thousands of meals in all. 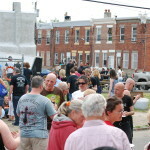 We partnered with local churches, rehabs, shelters, and community service organizations to be present and connect with those in need. Our team and other local volunteers prayed with thousands of people, providing free bibles, and faith building testimonies. 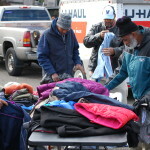 At some sites we were able to set up clothing drives before hand to distribute free clothing to those in need. Most importantly, we Loved. Everyone is welcome, everyone is valued, everyone knows they are valuable at the Save a Life Tour and the Kingdom of God. The Love of God, and the Will of God are what leads us to continue this Great Commission. We hope that you will spend some time looking through our pictures from 2015 and our other pages on the menu above to learn more about who we are, and what we intend to do in God’s name. Furthermore, we pray that some of you may be able to help us in this mission, and join us at one of this years tour stops. Please also share our page, and our posts on your social media pages to let your friends and followers know who we are, and what we do.